With over 25 years experience in consulting and designing, Allen Porter Corp. is known for quality results and outstanding customer service. Do you want to add to your outdoor living space, improve your lifestyle and increase the resale value of your home? Allen Porter Corporation has the perfect solution, expand your living space to include the outdoors! Outdoor BBQ & Kitchens: Have you ever dreamt of having your own outdoor entertaining oasis? By installing an outdoor BBQ or kitchen, you are able to enhance your outdoor living space for you and your guests. Allen Porter Corporation will work closely with you to transform your backyard into a fine outdoor entertainment escape. We work closely with highly qualified sub-contractors to bring your design to life! 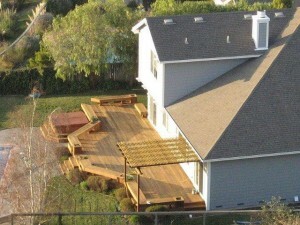 Decks & Patios: Decks & Patios are a great way to expand your living space into outdoor living. Adding deck or patio is the perfect way to add functional space to your home. Allen Porter Corporation has extensive experience in designing custom decks & patios to meet your individual tastes. Fireplaces & Entertainment Areas: Bring your backyard alive by adding an outdoor fireplace or entertainment area. All our fireplaces & entertainment areas are custom designed; Allen Porter Corporation will work closely with you to match the current style of your home or create a new and unique look. We also offer sprinkler and landscaping design too!